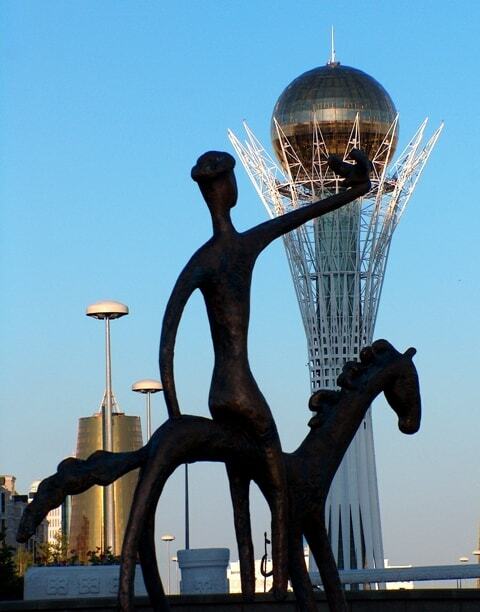 Home » Astana - capital of Republic Kazakhstan. Central Kazakhstan. Akmola of province. 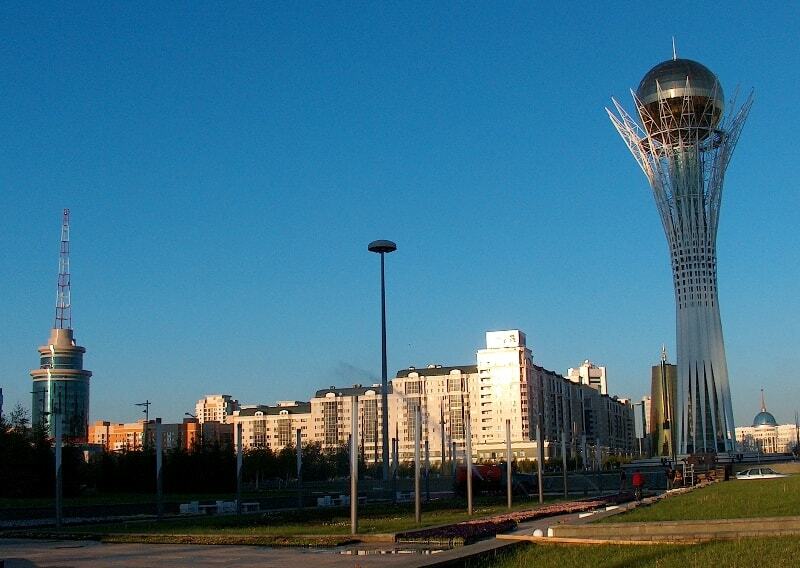 All citizens and guest Astana admire the scenery of this architecture construction. Every night it blossoms out like a flower from a fairy tale, pleases and enchants by its colours. There it is goldish yellow, al of a sudden it tums sky blue and in a moment you see a tenderly pink flower. White, green, blue, violet… Only the ball crowning the construction remains golden. Mytho-epic version of Baiterek best of аll expresses the ideals of the Кazakhstani people, who seek after living in реасе and harmony, and ad­heres to the national traditions. Оп the top of Kok- Тоbе mountain there grows the tree of life called Baiterek, and under the mountain there is аn immense осеаn. Every yеаг sacred bird Sam­ruk lays а golden egg (sun) in the сrоwn of Bait­erek. Every уеаг dragon eats the Sun, which sym­bolises the succession of day and night, summer and winter, strugg!e of good and evil, 'light and darkness. Тhе construction is 150 meters high. At the height of 97 meters there is аn observation place. Тhе number 97 was not chosen at а random. 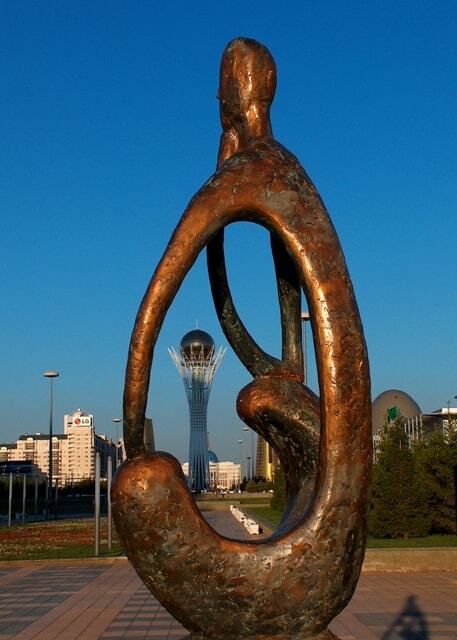 it stands [ог the уеаг (1997) when the capital moved [гот Almaty to Astana. There is а large restaurant and aquarium inside Baiterek. Тhе visitors саn go up to get а bird's-eye view ofthe city the observation place. Such а view takes one's breath away and gives аn unforgettable impression. As you drive from the airport towards the city, the first thing that stands out from a distance is a very tall structure on the right, crowned by a golden, glittering globe. This is the Baiterek observation tower, the "Tree of Life". 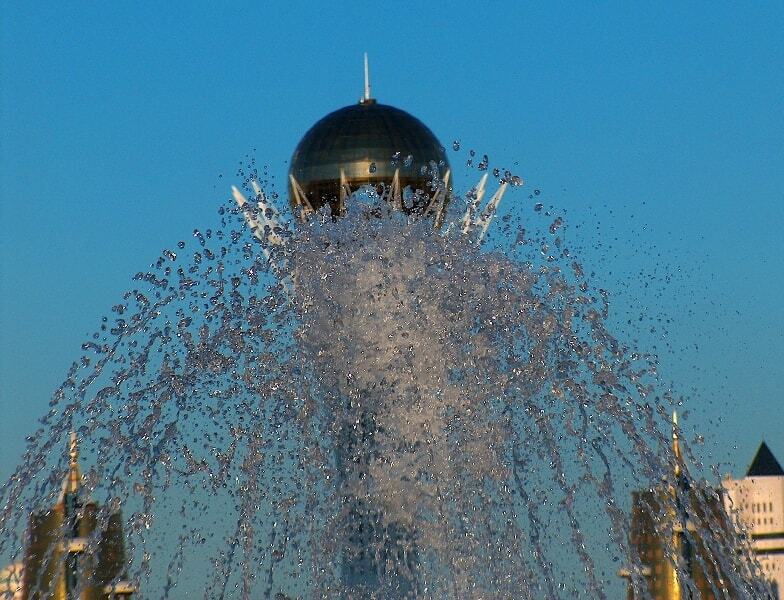 Baiterek… All citizens and guest Astana admire the scenery of this architecture construction. Every night it blossoms out like a flower from a fairy tale, pleases and enchants by its colours. There it is goldish yellow, al of a sudden it tums sky blue and in a moment you see a tenderly pink flower. White, green, blue, violet… Only the ball crowning the construction remains golden. Mytho-epic version of Baiterek best of аll expresses the ideals of the Кazakhstani people, who seek after living in реасе and harmony, and ad­heres to the national traditions. Оn the top of Kok-Тоbе mountain there grows the tree of life called Baiterek, and under the mountain there is аn immense осеаn. Every yеаг sacred bird Sam­ruk lays а golden egg (sun) in the сrоwn of Bait­erek. Every уеаг dragon eats the Sun, which sym­bolises the succession of day and night, summer and winter, strugg!e of good and evil, 'light and darkness. Тhе construction is 150 meters high. At the height of 97 meters there is аn observation place. Тhе number 97 was not chosen at а random. 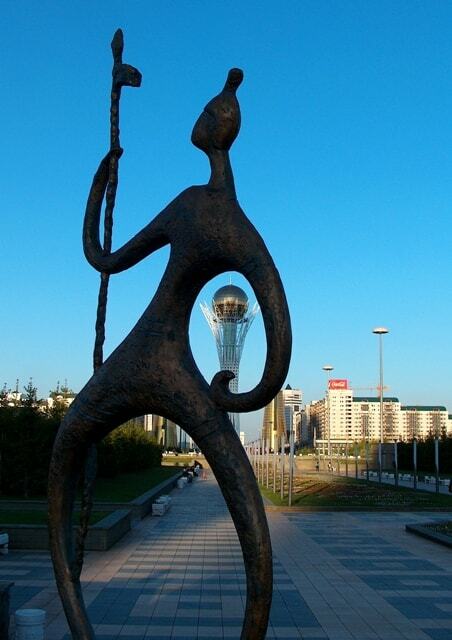 it stands the (1997) when the capital moved Almaty to Astana. There is а large restaurant and aquarium inside Baiterek. Тhе visitors саn go up to get а bird's-eye view ofthe city [гот the observation place. Such а view takes one's breath away and gives аn unforgettable impression. 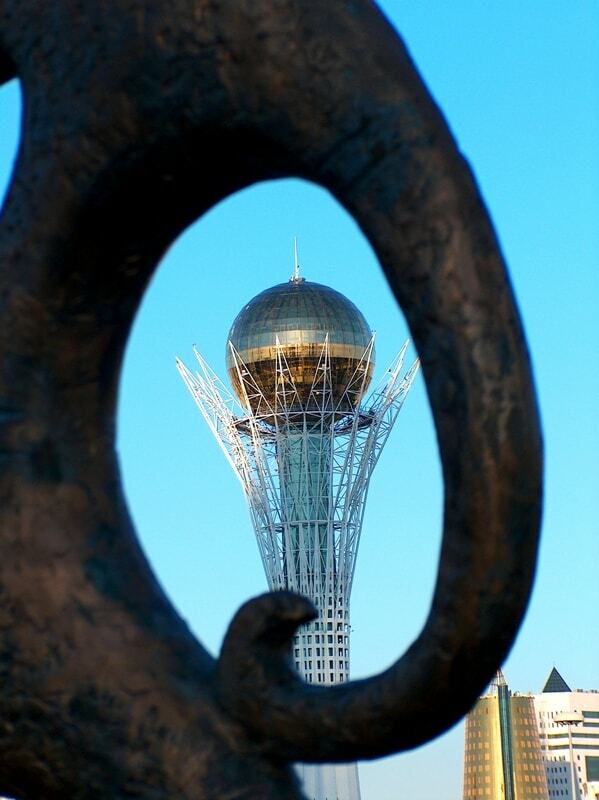 It was President Nazarbayev's idea, and he also has a clear view of it from his living room, for his new residence is located in full sight of the 97-metre-high structure. According to legend, the magic bird Samruk would lay a golden egg on the top of every tree that was out of reach to humans. All the secrets of human desire and passion were hidden inside the egg, as well as the answers to all their dreams for the future. With the building of Baiterek the egg is no longer out of reach, since two elevators whisk visitors up to the golden, gleaming globe set within the opening concrete "branches" of the white-trunked tower. From this vantage point, looking out through the gold-tinted glass, you may not grasp the secret of life's passions and desires and the key to their satisfaction - but at least you can admire how the President's vision of the future is rapidly taking shape.